TravelHerd, the FIT tour operating app is specifically designed for travel wholesalers and tour operators to book complex FITs as well as scheduled tours and specials with pre-set itineraries. TravelHerd has a robust booking engine and intuitively designed features all of your company’s departments reservations, sales & marketing, operations, documentation, accounting and administration will appreciate. TravelHerd subscriber companies never need to purchase upgrades as users are always accessing the latest version available of the secure, web-based TravelHerd FIT tour operating app from their offices or anywhere in the world with internet access. TravelHerd has a unique FIT booking engine consisting of a scratchpad to produce quick quotes and the reservations module for highly customized FITs, scheduled tours and other travel options. The scratchpad and the reservations module both utilize XML, vendor web sites and the internal database in TravelHerd in the booking process. Items added to the scratchpad can be generated into a proposal with the inclusion of the booking agent’s information, whether they are a travel agent or a direct consumer. Proposal and reservation itineraries and invoices can be emailed to booking agent/now client. The TravelHerd reservation module uses the same principle as the scratchpad for additions and revisions to an existing reservation. Reservations staff can also book scheduled tours and specials with pre-set itineraries, pricing and inventory from your TravelHerd database with one click ease, using TravelHerd’s FIT booking engine, and boost your reservations! Scheduled tours can also include options, pre- post- or within the tour’s itinerary, which can be offered when booking the tour and increase your sales and profits. TravelHerd offers an ideal way to quickly book scheduled tours without having to assemble itineraries from separate database components. With one click, the tour is booked, with its complete itinerary and pricing, while the tour departure’s inventory is debited at the same time. In addition to TravelHerd, the FIT tour operating app, Home of the Herds provides website hosting. Home of the Herds hosted websites can use the TravelHerd WordPress interface. The synergy between the two applications saves you from dual information entry and maintenance and precludes the issue of scheduled tours and specials having to be updated in each application when revisions become necessary and avoids out-of-sync data between the two applications. TravelHerd’s Travel Agent Portal allows tour operators to invite select travel agents, on an individual agent basis, to book tours and specials, including up-sell options and extensions, from within the secure TravelHerd Travel Agent Portal by themselves without the direct involvement of your staff. Travel agents logged-in to the secure TravelHerd Travel Agent Portal will also have access to review their upcoming reservations, including those booked via your sales consultants as well as those booked via the portal, enter their passengers’ names and other information to their upcoming reservations, issue invoices, client invoices and itineraries for their upcoming reservations as well as additional functionality. 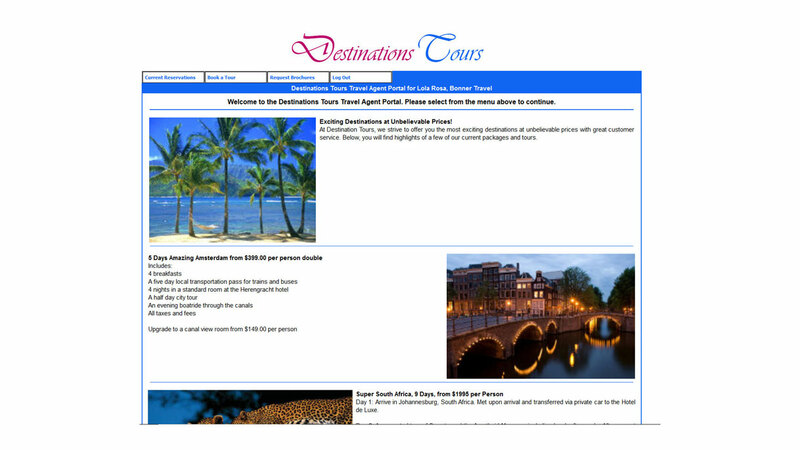 Using the TravelHerd WordPress interface makes it a breeze to set up your scheduled tours and specials for on-line sales via TravelHerd’s Book Now online reservation portal (B2C) and TravelHerd’s Travel Agent Portal (B2B) and boost your reservations! Aside from deciding where to put the Book Now link on your scheduled tour or special web page, the rest is done by TravelHerd. Contact us today for a demonstration of TravelHerd, the FIT tour operating app and we will show you how your company can sell scheduled tours and specials from your TravelHerd database on your website via TravelHerd’s Book Now online reservation portal and boost your company’s sales! Put TravelHerd, the FIT tour operating app to work for your company. Request a TravelHerd demonstration.